Most good food is a craft, repeatable and reasonably straightforward and produced by an attentive crew following thoughtful procedures. And then there’s barbecue. Its “simplicity”—rub large piece of meat with spices, apply heat, and smoke—conceals its complexity. A real pit master is a craftsperson, sure, but they’re also an artist, making piles of subjective judgment calls to bring BBQ meat to the apex of flavor and texture. In short: Most people, given some time and a recipe, can make good barbecue. Making great barbecue is incredibly difficult. 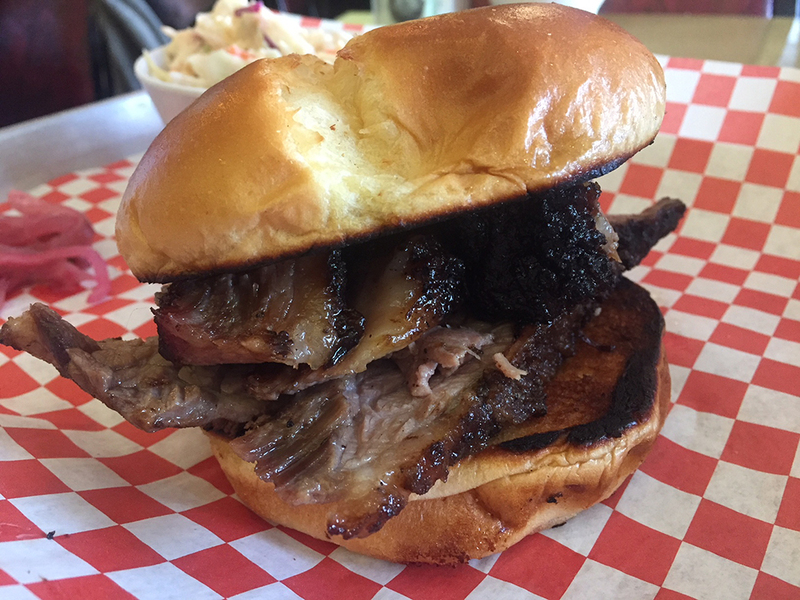 All of this is to say that what Jellybean and Julia’s is accomplishing with its Brisket Sandwich ($12) is really remarkable, and—we thought—well worth the drive from St. Paul to Anoka. The brisket itself has a lovely, flavorful bark, a pronounced smoke ring, and a texture that’s tender without shredding or turning gelatinous. Doused with one or both of the shop’s housemade sauces (a tangy, molasses-kissed apple bourbon sauce or a cheerfully kicky and funky mango habanero sauce) this stuff is pure heaven on a toasted brioche bun. And it doesn’t hurt that the Jellybean and Julia’s shop itself is about two-tons of charm in a 20 pound sack. The space is warm, inviting, and cozy, somehow rammed with memorabilia without feeling cluttered. Any good BBQ tour of the state should include the pilgrimage to Anoka—they’ve got the goods.